On 2 October 2009, Pan African Space Station presented Nothembi Mkhwebane, LIVE at Centre for the Book, Cape Town. 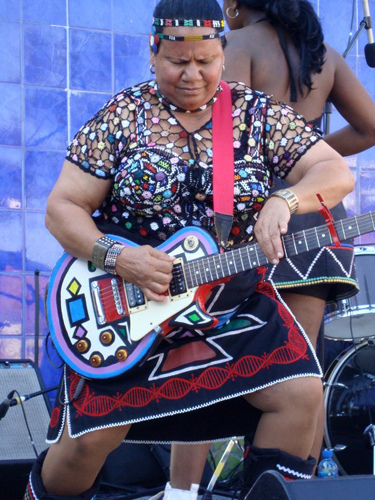 African Queen of Ndebele music Nothembi Mkhwebane tunes her electric guitar to both urban and rural traditions, engaging the now through age old verbal idioms of experience, and a polyvocality of tone, tune, and texture; of hue and cry. Mkhwebane has her roots in rural Mpumalanga where she grew up steeped in Ndebele musical traditions. Since her move to Pretoria in 1977 she has recorded multiple albums, collaborated extensively and formed her own record company. At once soulful and ecstatic, visually mesmerizing and intellectually challenging, her spectacular performances combine music and song with wildly energetic dance routines and sensational outfits, decorated with typical, intricate Ndebele bead and metalwork. These have secured her a following both in South Africa and abroad and she regularly performs everywhere from cultural gatherings and traditional ceremonies, to big stages in the US, the UK and Europe. Category: Pass Blog | Tags: Nothembi Mkhwebane | Bookmark: permalink.